Modern engineering might be clever, but often not solid. Modern engineering is about cost efficiency, to save material or allow use of cheap material. The statement is founded on experiences made in recent time. I am referring to experiences made June 2018, when I had my motorcycle incident in Germany. Read about the details here and the following post. The motorcycle has undergone a complete reconstruction. There’s nothing left that, potentially, could bear the hallmark of the incident. You doubt that? Well see this post for some of the details of what’s been changed. 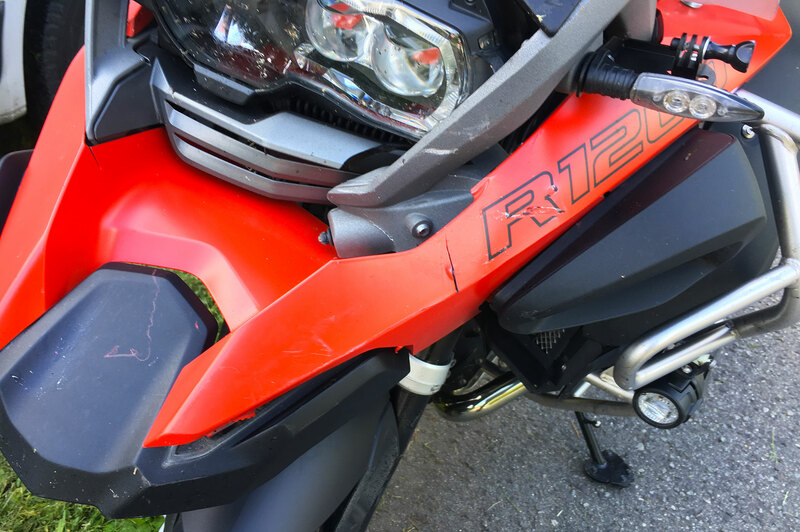 What I’ve learned from my incident is that BMW Motorrad, like everyone else, builds modern complex, solid, yet fragile, brittle and bloody expensive products & solutions. Yes I know, an oxymoron. The contradiction is related to not only construction, but also choice of material. e.g. cheap material. First off, the plastic in front is, IMO, incomprehensibly brittle, and poor. As with everything else in this material world, engineering (too often) is about finding cheaper ways to dupe everyone into believing it’s better. In most cases, it’s not. The next model will quite likely have even cheaper materials than the previous. The law of physics and economy commands this development, all while maximizing profit is the single most important exercise. If you toss a bit of quasi-environmentalism into the mix, you end up with complex restorations post impact. The entire front system of the GS is where some of the most expensive gear on the bike sits. Like the headlight cluster. Here one could have built in something to offer better protection. The impact I had took place in very low speed. Right under it is vital electronic components. There’s a high probability these will suffer on a frontal blow. With a few Euro extra invested in hardware design and wiring, these components could have been moved somewhere safe. The telelever system is the next thing. Because If you hit something sideways, or front, it almost certainly it will be damaged. The only sensible thing to do is to change the entire system. And when you do, make sure to change all bearings, brackets and what have we. On my GSA, they did that. changed the entire telelever, with all bearings, brackets, forks, stems, nuts & bolts. So in essence, while this frontal construction is one of the best and most sophisticated there is, it certainly comes with a price tag. a HUGE price tag. Said above, my impact took place in very low speed. I hit a car rear but sideways or more precisely, the corner of the rear fiber glass fender. Beginning on the assembly they noticed the telelever fit was a bit too snug. Indeed, the main frame had received an impact too. The assembly stopped, insurance company contacted. This was going to be a much bigger job than previously anticipated. Two weeks later the assembly was reversed to disassembly. The central frame also had to be replaced and that pretty much means, take everything apart. 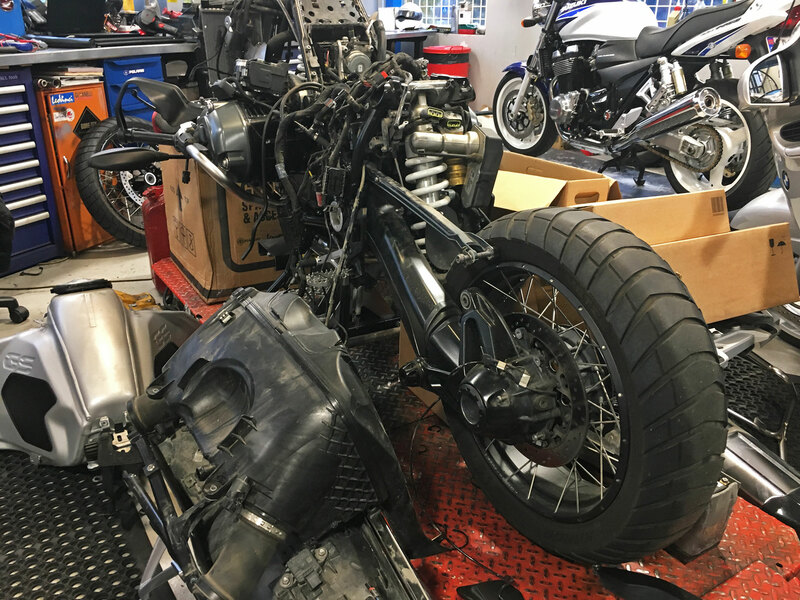 Over the course of the coming months or during winter (fortunately for me) my dealer workshop plucked the motorcycle down so that only the engine, crankshaft and rear wheel was left on the bench. Pertinent question. But in my case and, have I later come to believe, in many other cases, where the motorcycle is not a total wreck, repairs will be attempted. Costly repairs, so don’t even consider to ride these modern things without full insurance! In cases of accidents motorcycle will be repaired if the assessed total cost of repairs + parts comes in under 60%. Well at least that’s how they do it in my country. In reality it might go further, because of the price of a new motorcycle. I have learned this first hand, from the workshop that did restoration of my motorcycle. It is not the only one that has been subject to a total reconstruction with new parts. EUR15.644/US$17.790 is more than what the R1200GS Adventure costs new, many places in the world. But things tally up and I’ve seen the price list in Germany for parts. Not far apart from what it is in Norway. Bottom line: if you ever become involved in a minor happenstance, make sure the motorcycle is taken completely apart. Don’t settle for anything less. Regardless of the how’s, the central frame might take punishment. For your peace of mind it better all be new. as reflected in my earlier post perceived as low. I did not have time to register exact speed, busy enough trying to avoid impact. Image above suggests degree of success (or failure). Damage of the car: as picture above indicate, the damage was more of a surface type. 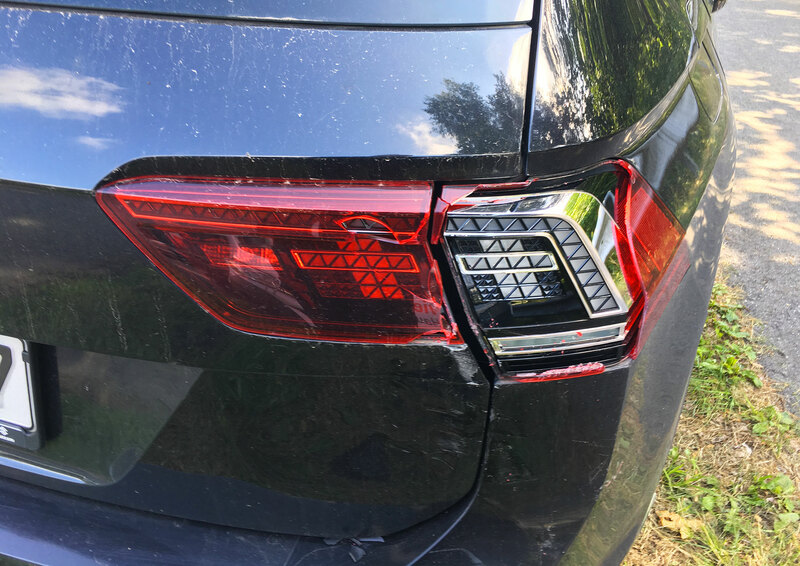 A taillight damaged, plus some surface scratches in the body. At moment of impact I banged my leg into the cylinder of the engine. Received a decent blow, with swelling that lasted or days, but nothing broke. Had the speed been “high” it would, due to the nature of the hit, be reasonable to believe my physical injuries would have been more severe. Like a broken leg. 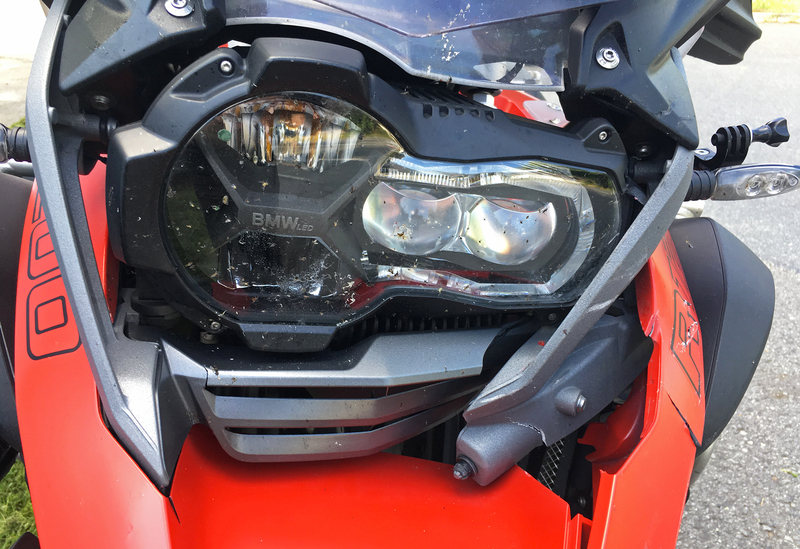 Post accident assessment: BMW Motorrad Zentrum Hannover could not see or find any damages that had affected steering geometry. Specialists ran full diagnositc, test rode the bike plus had it on the bench. They did however recommend change of the entire front, e.g. telelever, bearings, brackets etc etc. Damages to the main frame was discovered only during reassembly of the entire front. What I believe or expected? Well that a seemingly low energy, low speed impact, should not have caused the described extent of damages. But comparing accidents is at best speculative. Some are lucky, others not. I was both unlucky and lucky at the same time. Lucky that i could ride off, after the bike was patched together, and continue my adventure. This entry was posted in MC related, miscellaneous and tagged Change, MC related, Safety. Bookmark the permalink.